A new trailer has been released for Game of Thrones, the upcoming RPG based on the George R.R. Martin books and HBO series. 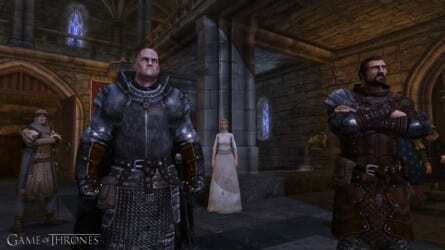 The trailer focuses on the game’s story, which follows Mors, a brother of the Night’s Watch, and Alester, an exiled Red Priest, set at the same time as the first novel. The game is set to be released in the first quarter of this year. This new trailer will immerse you in the heart of the intrigue of the Game of Thrones RPG, a story tainted by treachery and backstabbing. Guided by vengeance, allegiance, honor and family, the two heroes of the game – Mors, sworn brother of the Night’s Watch, and the red priest Alester – will travel across Westeros and its most famous locales to tackle life-changing quests. From the Wall to King’s Landing, the destiny of our two heroes weaves a complex tale as they meet famous figures, discover plots and conspiracies, all the while seeking answers to their questions. The game is being developed by French developer Cyanide Studios, under supervision of book series author George R.R. Martin. The company is known in Europe for sports management sims like Pro Cycling Manager, but they have also been developing RPGs as of late, including the upcoming Of Orcs and Men.